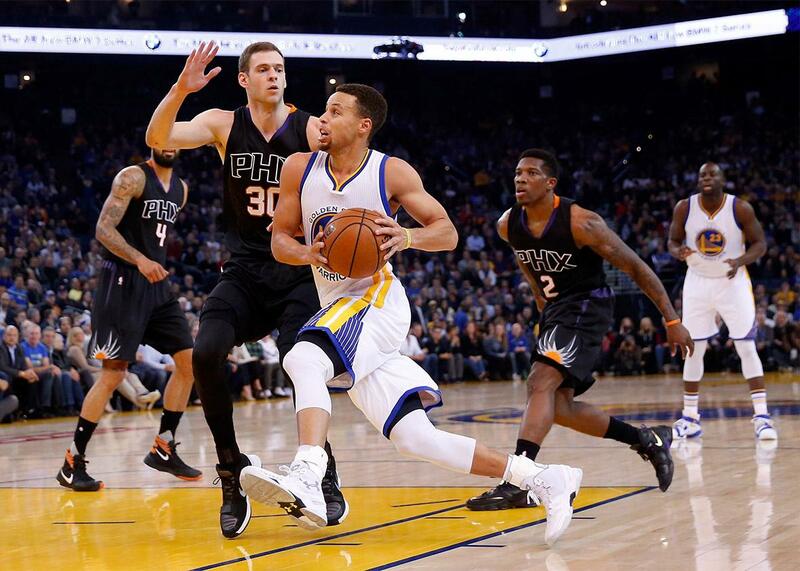 Steph Curry video highlights versus Phoenix Suns. The most recent preposterous play from the league’s most magical player. Stephen Curry, No. 30, of the Golden State Warriors drives on Jon Leuer, No. 30, and Eric Bledsoe, No. 2, of the Phoenix Suns on Dec. 16, 2015 in Oakland, California. Steph Curry and the Golden State Warriors got back to their winning ways on Wednesday night and then some, dismantling the Phoenix Suns to run their league-best record to 25–1. For much of the night, Curry took a backseat to his fellow Splash Brother, Klay Thompson, who dropped 43 points, and Draymond Green, who posted his fourth triple-double of the season. Thompson and Curry combined for 68 points through the first three quarters (outscoring the entire Suns squad by three points during that stretch). Despite contributing fewer of those points than Thompson, Curry still managed to find his way into the highlight reel more than once, including a third-quarter rainbow runner after taking a through-the-legs pass in stride. For my money, though, Curry’s best play came late in the first half with the game still close. As the Dubs caught the Suns getting back slow on defense, Curry drew two defenders and then, after going behind his back, casually flipped a pin-point, no-look pass to a trailing Klay for the wide-open three. Swish. Late in the third quarter, Steph stole an entry pass on the defensive end, raced across half court, and—falling forward after being bumped—launched a circus shot from 29-feet in an effort to draw the foul. He didn’t get the call. His one-handed prayer, though, found the backboard on its way through the hoop. Sometimes it’s better to be lucky than good, but it’s always better to be both.